I have never had any interest in Ichimoku Trading in the past. I don't really have much interest in trading it now. However, I am curious as to what it is all about. Apparently, I'm not the only one, as I got a comment from Adam on Facebook asking about it. If I don't want to trade it, then you might be wondering why I'm going through so much trouble to research the topic. Well, I strongly feel that knowing more trading strategies will make me a better trader because I may be able to use a concept that I learn to improve my trading. Sometimes, it just takes one good idea to turn a system from untradeable, into a solid system. 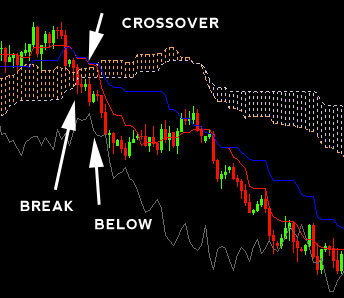 A good case in point is the combination of the pivot system, that I learned a long time ago, and the Trade Up method. So in this post, I will show you what I learned about Ichimoku Trading and where you can get more information if you want to learn more. Nothing in this post is revolutionary, but hopefully I have explained it a way that is easier to understand than on other sites. I probably still won't be interested in trading Ichimoku after this, but I'll let you know at the end. However, at the end of this post, both of us will know much more about trading this odd Japanese indicator and hopefully be able to take away some knowledge that we can use to improve our trading. Let's take it back…way back. The full name of the indicator is Ichimoku Kinko Hyo and was invented in the 1930's by a Japanese newspaper reporter named Goichi Hosada. He wanted to create the ultimate trading indicator (sound familiar?) and supposedly took 30 years to develop Ichimoku before publishing it. I also found that not many US traders knew about the trading strategy until the 1990's. Since then there has been quite a bit of interest in the method, but there still do not to be too many people outside of Asia who use it as their main trading method. At least from what I could find. In my research, I was also not able to find out if Goichi was actually able to use it to profit, but ever since he published the book, it has been a popular trading method in Asian trading rooms. Because of this, the Yen pairs supposedly respect Ichimoku levels and watching this indicator might be a good way to gauge where these pairs are going. 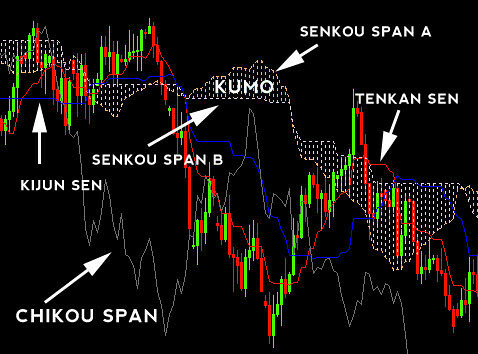 So Ichimoku Kinko Hyo was designed to be a chart in which you can see the balance of the market, at a glance. It is a trend following indicator, with a built-in support a resistance measurement. That's great in theory, but what is involved in all this Ichimoku-ness? Here are the components that actually go into it…you can check out the video or read the text below. Kumo (or the cloud): It is made up of two components, the Senkou Spans A and B. Span A (first leading line) is calculated by: (Tenkan Sen + Kijun Sen)/2, shifted forwards 26 periods. Span B (second leading line) is: (highest high + lowest low)/2 for the last 52 periods, also shifted 26 periods in the future. So when do we actually enter trades with this indicator? The entry consists of three parts. First, we are looking for the Tenkan Sen and Kijun Sen to crossover. Second, we are looking for a confirmation break of the cloud in the corresponding direction. Finally, the Chikou Span should be below price in a downtrend, or above price, in an uptrend. This can be hard to imagine with so many lines, so let's take a look a couple of specific examples. 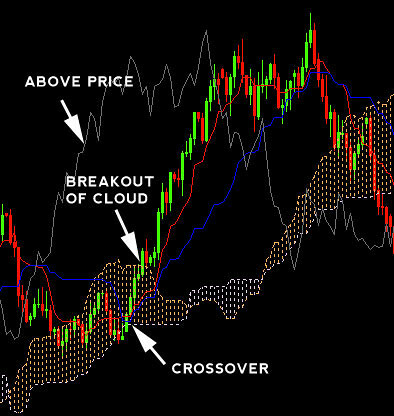 In an uptrend, you would enter long when price closes outside of the cloud to the upside. As you can see, the Tenkan Sen (red) has crossed above the Kijun Sen (blue), which is a bullish signal. Finally, the Chikou Span is well above price, also giving us a bullish signal. You would place your stop below the breakout candle, inside the cloud. Where the crossover happens is also supposed to be an indicator of signal strength. If the cross happens below the cloud, it is a weak signal, inside the cloud is a medium long signal and above the cloud is the best. Then the short, is just the opposite. You are waiting for the red and blue lines to crossover, then wait for price to close outside of the cloud to enter the trade. The Chikou is below price, so you are all set there. The exit can be handled in different ways. You could exit when price enters the cloud again, or when the Tenkan Sen (red) crosses the Kijun Sen line (blue). Another target could be another area of support and resistance. Test it out and see which exit works for you. I did my best to find credible sources on the topic of Ichimoku trading and if you want to continue your education, you may want to check out these sites. There just aren't that many sites out there. If I have used the material below, then I say so. Otherwise, these simply look like good resources on the topic. 2nd Skies Forex – I have personally purchased this course and I am trading one of the strategies. The best part is that there is something for everyone in this course. There are daytrading and swing trading strategies, along with specific rules for entries and exits. I highly recommend it. Action Forex – They provide frequent analysis on Ichimoku and Candlestick trades. Forex Factory – One of the Ichimoku trading journals on this huge forum. You can browse the other threads and find some good information. Forex Street Social Network – A collection of blog posts about Ichimoku analysis. In my opinion, the Ichimoku indicator is way to complex. I believe that there are simpler ways to trade. However, since many traders seem to use it successfully, it can be a viable option to explore. Remember to trade safe and test out any idea thoroughly before actually trading it. One thing to keep in mind is that there can be a lot of voodoo associated with some trading methods, so be sure to find out for yourself what works and discard what doesn't. One such trading method that comes to mind is candlestick patterns. I personally really like using candlesticks, but there is a lot of hocus pocus with some of the patterns. I have seen a few traders remove the Chikou line and others only trade the cloud. Just like any other strategy, you have to make it your own and do what works best you. I hope you found this information helpful, because I did. Now I know 100% more about Ichimoku Kinko Hyo than I did before. Update (January 2015): I have since changed my mind about Ichimoku being “too complex” and have implemented a strategy into my trading. Find out more about what I use.